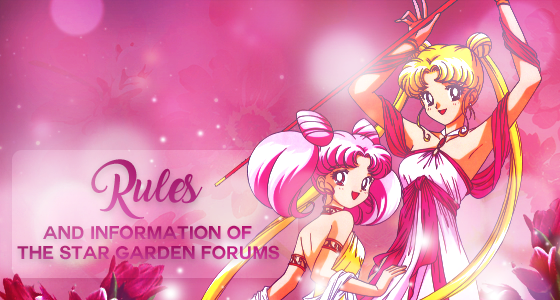 Welcome to The Star Garden Forums, a sailor moon fan forum. You can discuss sailor moon and it's many incarnations, be it the manga, anime, crystal, sera myu, PGSM and otherwise. Everyone is welcome here. We unfortunately have rules, but none of which can limit fun and are for the safety and enjoyment of all members. This is a thread dedicated to information about the site including rules. Member Ranks: what else do I need to say? The Silver Emporium: Our virtual shop filled with digital goodies. Newbie thread: new members may want to check us out! Forum Mini-Tutorials: Tutorials for new members and old members alike. Go here if you're confused about a posting function! About Us: Information about the site, social media links, staff and more. Site Credits: read up for credits and dedications. Forum Rules: general rules on the forum. Discord & Cbox Rules: rules for our discord server and cbox chat. Roleplay Rules: rules relating to RP here. Site Graphics Guide: Avatar, signature, and other graphic rules. Stars 101: A thread that discuses our virtual currency. Curse sparingly. While a 'crap' or 'hell' is allowed, please make sure language conforms to a PG-13 rating. Mark spoilers accordingly. Not only is not tagging spoilers against the rules, but it is also extremely inconsiderate. Do not steal any content from users including art, graphics/edits, fanfiction, writing, or otherwise. No bullying, bigotry, discrimination, harassing or impersonation. Be nice and respect everyone. Do not link to or post mature content. This forum is rated PG-13. If you advertise here, you must have a guest-friendly board on your forum for our staff to do the same. Forum usernames are not allowed to be canon names (although things like princess moon, last chibiusa, JupiterThunder etc are fine) because they are reserved for staff. The administrator's word is final and these rules may be changed anytime. As a member, it is your responsibility to know of them. If you disagree with something you got a warning/ban/suspension for, please PM a mod. Like most forums, we have a strike system. However, we try to be as friendly and lenient as possible. Also, some things may result in an instance ban and other things might result in more than 3 warnings. These statements do not cover every situation that involves rule breaches. First rule break, warning. Sailor Jupiter, Sailor Mercury or Neo Queen Serenity will PM you regarding your rule breach. Second rule break, warning. Sailor Jupiter, or Sailor Mercury will PM you regarding your rule breach. Third rule break, warning. Sailor Jupiter, or Sailor Mercury will PM you regarding your rule breach. Fourth rule break, one week suspension. Sailor Jupiter will PM you regarding your multiple rule breaches and when you will be allowed to return. When you are suspended, you will be allowed to see the forum, discord, and cbox, but you will not be allowed to post in any of them. If you try to post anyway, your suspension will escalate to a ban. Fifth rule break, two week ban. Sailor Jupiter will PM you regarding your current and previous rule breaches. While on a ban, you will no longer be able to access the forum, discord, or cbox. You will receive the "temporary banned" usergroup. sixth rule break, three week ban. Sailor Jupiter will PM you regarding your current and previous rule breaches. You will receive the "temporary banned" usergroup and rank. Seventh rule break, 1 month ban. Sailor Jupiter will PM you regarding your current and previous rule breaches. and you will be given a final warning. If you break a rule once more, you will completely lose access to the forum. You will receive the "temporary banned" usergroup and rank. Final rule break, permanent ban. Sailor Jupiter will PM you regarding your current and previous rule breaches. You will either be placed in the banned usergroup and rank with a black username, or you will have your account deleted. Which mod can I go to if I need help? Answer: Sailor Jupiter, Sailor Mercury, or Neo Queen Serenity. The may be updated in the future.